Cayman Compass, Thursday, August 20, 2015. 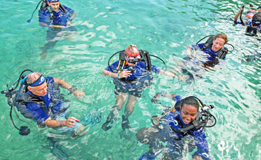 Many thanks to David and Vicki Legge, good friends of Stay-Focused, and reporter Kelsey Jukam, for this article about our first-time diver program. On Saturday, June 27th, 2015, Ryan Chalmers and Roger Muller joined Tom Ludington, US General Manager for the Cayman Islands Department of Tourism, at the 3rd Annual NBC 4 New York & Telemundo 47 Health & Fitness Expo. 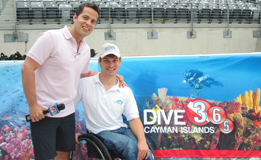 Ryan met and chatted with Raphael Miranda, WNBC’s weather producer.